The catalyst to this recipe was a handful of shredded coconut that I had left over from my No Sugar Added Banana Nut Granola. I didn’t want to throw it away, but it really wasn’t enough to make anything with. The leftover shredded coconut happened to be sitting next to the oat bran and suddenly everything CLICKED. Cook the oat bran in the coconut milk and use the shredded coconut as garnish. Bingo! Luckily it was a can of LIGHT coconut milk that I found, as full fat probably wouldn’t have quite enough moisture to really cook the oat bran. Oat bran usually takes about 3-4 parts water for every one part of oat bran, so I just supplemented the coconut milk with enough water to make up the difference. 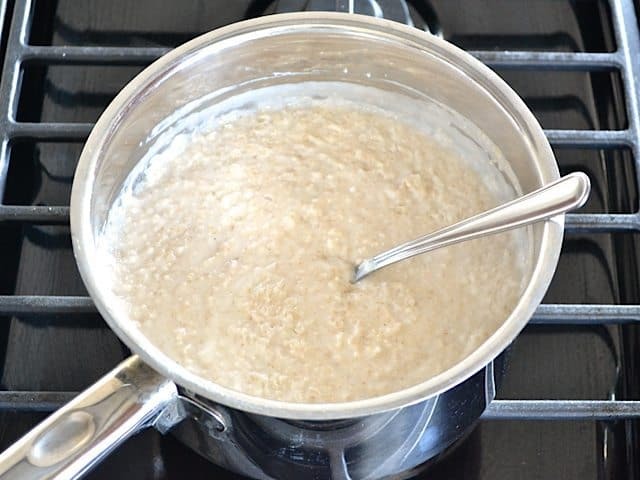 The result is an ultra creamy oat porridge that has great filling power. I left the Toasted Coconut Oat Bran savory and added sweetener to each bowl individually, based on what I was feeling that day. I tried brown sugar (classic), maple syrup (yum), and raspberry jam, which was my favorite. The slightly tangy berry jam made a nice contrast to the warm creamy oats. You gotta try it! 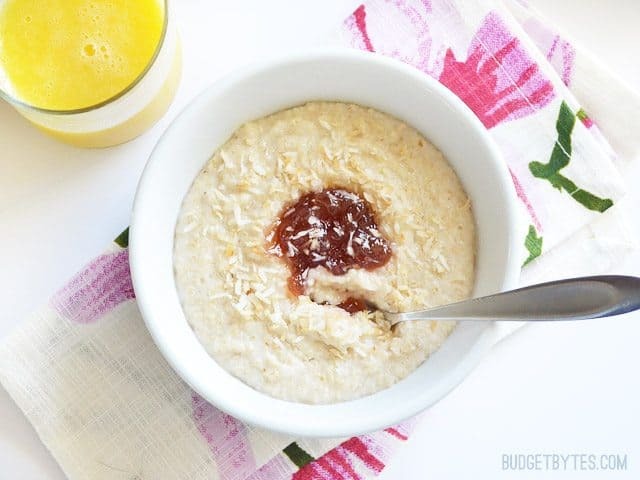 Coconut milk is the secret ingredient to making this Toasted Coconut Oat Bran the warmest and creamiest bowl you've had for breakfast. Add the shredded coconut to a dry skillet. Stir and cook over medium-low heat until the coconut is golden brown. Remove it from the warm skillet immediately to stop the cooking, and set it aside. 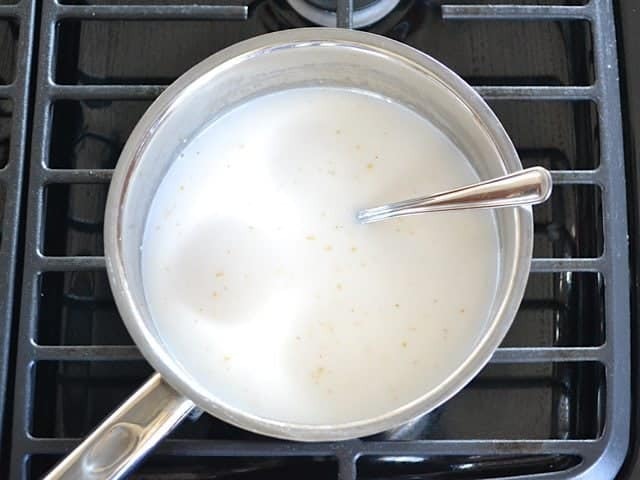 Add the can of coconut milk, 1.5 cups of water, oat bran, and 1/4 tsp salt to a sauce pot. Cook over medium heat, stirring frequently, until thickened. 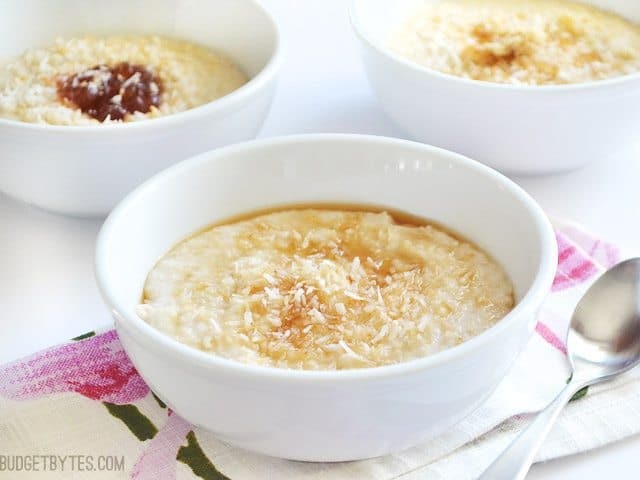 Divide the cooked oat bran between four bowls and top with the toasted coconut. Add the sweetener of your choice, if desired (brown sugar, honey, maple syrup, and jam are all nice), or enjoy as is. **If you don't have shredded coconut to use as a garnish, this still tastes amazing. Start by toasting your coconut. This heightens the flavor and makes it very pretty (pretty IS important sometimes). I used about 1/4 cup because that’s what I had, but you can use more or less, it’s up to you. 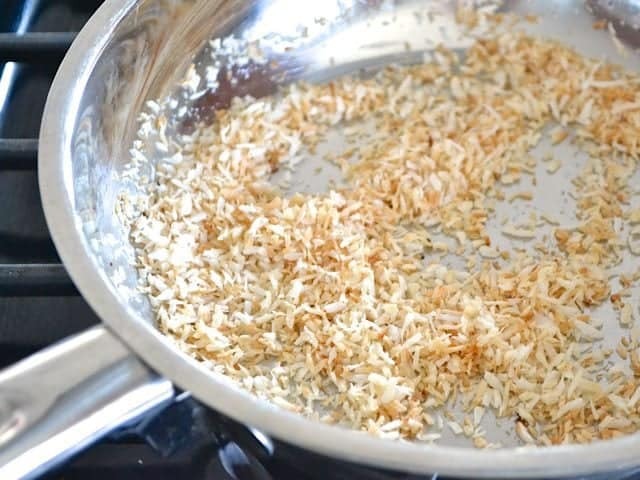 Place the shredded coconut in a dry skillet and cook over medium-low heat, while constantly stirring, until it’s golden brown like the photo above. Once it reaches that color, remove it from the skillet immediately to stop the browning (the residual heat in the skillet will keep cooking it otherwise and risk burning). One 14oz. can of light coconut milk. Oat bran needs about 3 parts liquid to every part oat bran. The coconut milk was 1.75 cups, so I added an additional 1.5 cups of water (that makes 3.25 cups – an extra 1/4 cup liquid for good measure). So in the sauce pot you have one 14oz. can of light coconut milk, 1.5 cups of water, and 1/4 tsp salt. The salt helps bring out the flavors just a bit and keep it from being bland. I sometimes like to add an extra pinch of salt and make it more on the savory side. Cook the mixture over medium heat, stirring frequently, until it reaches a simmer and thickens. It doesn’t take too long. 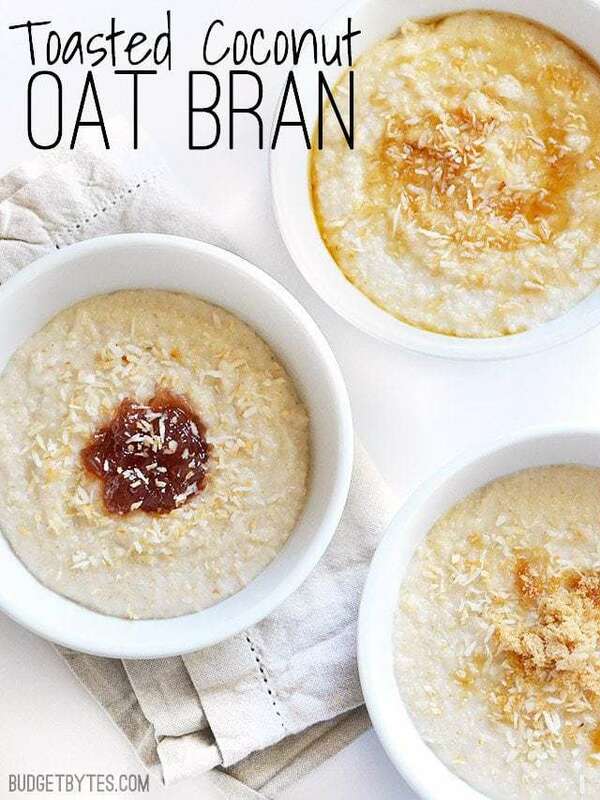 Divide the oat bran between four bowls, add the toasted coconut, and the sweetener of your choice (if desired). I kept the extra servings of the Toasted Coconut Oat Bran in the fridge and they reheated easily in the microwave. You could probably reheat them in a sauce pot on low if you add a smidge more water to help loosen it up. I broiled some sweetened coconut and that made this super delicious. My baby liked it too! I made this recipe this morning and thought it was delicious! I am a big oatmeal and coconut fan, so I was excited to try this. I have also never made oat bran before, so I was curious. I thought the creamy texture was great and the coconut flavor was there – but not too overpowering. Nice change in my morning routine! Omg! This looks so good! I can’t wait to make this! Always love and appreciate your posts! I used to make something very similar using millet. 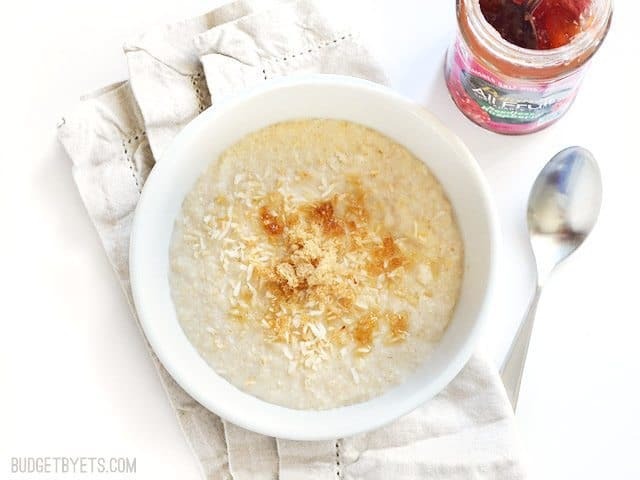 The porridge was made with coconut milk, some type of fruit (usually dried figs), nuts, and shredded coconut. Made this for breakfast yesterday and found that the cold leftovers today were even better! I didn’t have oat bran, so I used quick cooking oats. My favourite combination is with raspberry jam and a bit of vanilla almond milk to add some liquid back. This sounds delicious! I will have to pick up some oat bran, but in the meantime, do you think it would work with cream of wheat? Probably, yes! They’re very similar. This is awesome! I love breakfast food so much and my favorite flavor for anything is coconut. 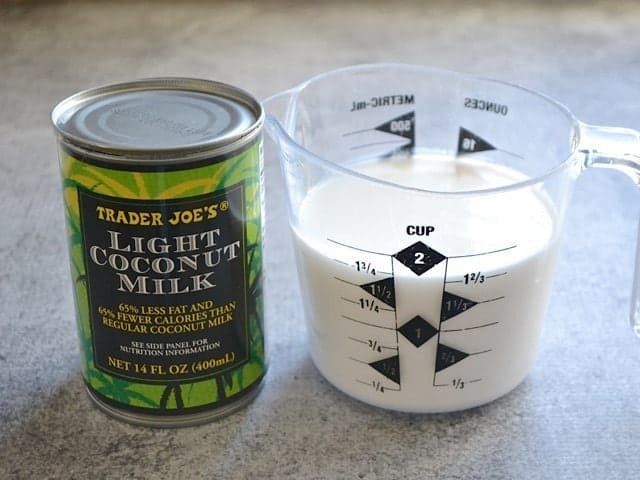 It’s good to know that Trader Joe’s is the place to find the cheapest coconut milk (and I’m sure it’s of great quality as well) along with the recipe. I can’t believe I could make this so quickly in the morning for breakfast before my day of classes begin. Do you think this recipe would work with other types of milk, such as almond milk? I’m also a huge fan of that. And plus – anything with toasted coconut on it has me SOLD! Great recipe. I love your site! Keep the recipes coming. 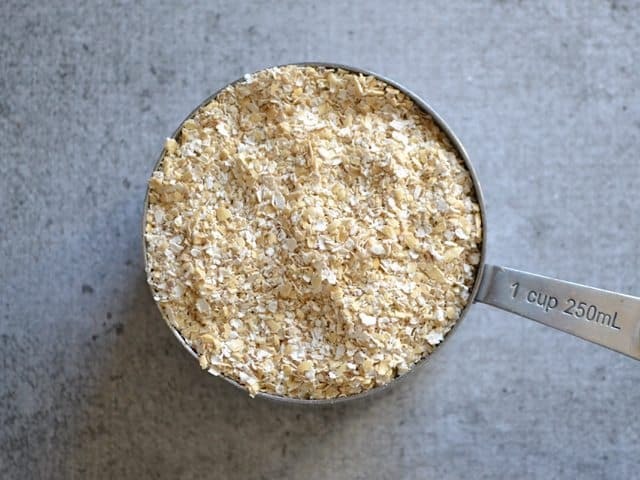 Could you use oatmeal instead of oat bran? Yes, but the liquid ratio for oats is different. Two parts liquid for every one part oats. Light coconut milk is just regular coconut milk that has been diluted with water, so you’re essentially getting half the product for the same (or a higher) price. I would recommend using half a can of regular coconut milk. Make sure to shake it well before opening or mix with a fork once opened. The other half can be frozen in a ziplock bag or ice cube tray and used for the next batch or a thai curry. Yes! I was going to post the same thing! I always buy full fat coconut milk and mix it with an equivalent amount of water. Twice as much light coconut milk instantaneously, at the same price! I can just imagine the taste with my favourite Light’n Fit Yogurt Toasted Coconut Vanilla. Yum!